If you do, install a program from your grip or heap, lowering the install cost of that program by the cost of the program trashed. This card is great in conjunction with icebreakers that "run out", since it can trash an installed icebreaker and then install the very same one back from the heap! 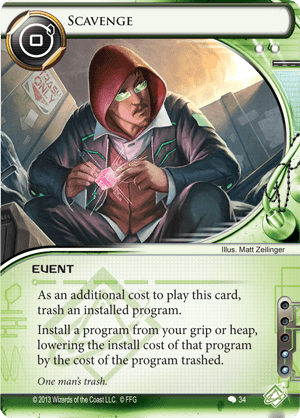 This possibility is confirmed in the official Netrunner FAQ. The net result is that you can recharge a spent breaker without paying any more credits. Key targets for this card include the Cerberus family of breakers, D4v1d and Overmind. At present, we can see that the card is very popular in Prepaid VoicePAD Kate "Mac" McCaffrey: Digital Tinker decks as a Cerberus "Lady" H1 recharger. The card is also a great way of rearranging your breakers, for example when you are at the MU limit and wish to replace a breaker in play with one in your grip or heap. Again, the card helps realize this goal at a reduced cost. Another potential use is with Cyber-Cypher, to redeploy the breaker to another server at zero cost. Overall the card is very strong, particularly with breakers that expend power counters. Now that London Library exists, Scavenge and Exile: Streethawk may get some extra juice. With one Torch in the bin (perhaps via Inject? Or you can just let a Torch expire on your library, if you're ballsy) and one in your hand, you can host the Torch onto London Library click #1, Scavenge it with click #2, and enjoy your free program on click #3+ without ever worrying about paying that silly 9 credits. Femme Fatale is also a good candidate for this strategy, though you would lose out on ping-ponging her targeting on the Library if you decide to install her legitimately. With some Same Old Things one could pivot the Femme (with one in the bin and one in play) with Scavenge if you're desperate.